Individuals present their cards upon entry. If the card is valid, access is granted and one person is allowed to pass through the optical turnstile lane. Infrared sensors located in the center of the sensing area count and determine the direction of persons and objects passing through the turnstile lane. Attempting to enter without presenting a valid card generates an alarm via LEDs and a sounder at the point of entry, and via relay outputs to your access control monitoring station. 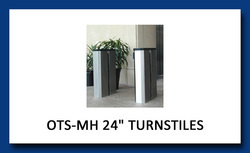 Kouba Systems Optical Turnstiles are available in a variety of turnstile housings. Standard models are constructed of stainless steel with a brushed finish, or with a powder coat finish. Custom powder-coat finishes, specialty metals, and Corian® tops are available for our stainless steel models. 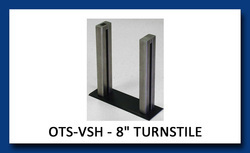 Our full length and medium turnstiles are also available with either rounded or beveled ends. Control electronics, graphic displays, and sensor housings are available without the turnstile housing. Components can be configured for either card in / free exit or card in / card out operation. Card reader system is not included in optical turnstile package. 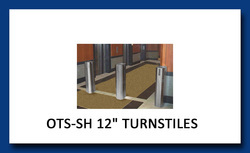 FULL LENGTH TURNSTILES - SIZES 36" TO 60"
SMALL TURNSTILES - SIZES 8" TO 24"